Mud Ninja is a little race in little itty-bitty South Salem, OH. Or so that’s how it seems when you take a look at their website which hasn’t seen a real update in years. You decide, it’ll be fun to get a small local event in and not take things so seriously for a weekend, so you register and plan for a casual weekend amongst all the machismo, competitiveness, and brutal courses in this sport. Then you get there and you see the obstacles up at the top of the hill in the festival area, you see all the team tents set up, and you see the starting corral for the 9:00 wave and it rivals many major series’ competitive heats and you start to question that whole thought of a “casual” event. 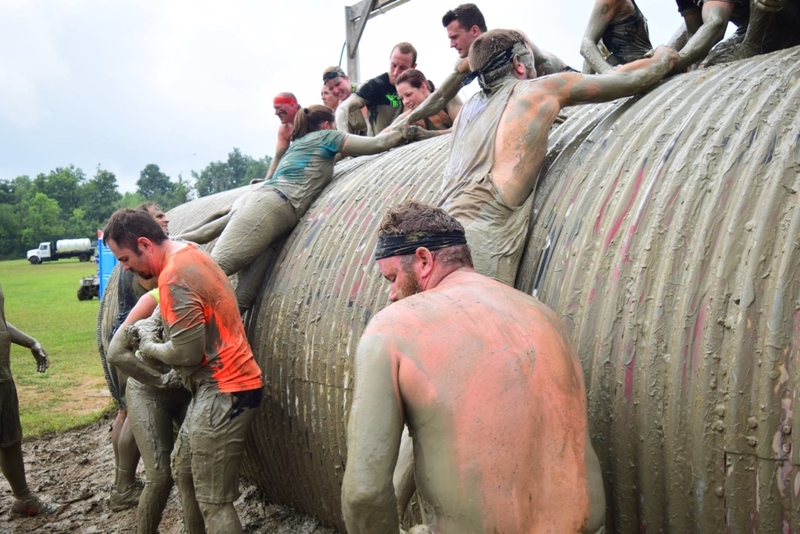 Yeah, Mud Ninja is one of the most grueling and competitive obstacle courses in the Midwest. It may be little by way of distance at somewhere between 3-4 miles and small by number with around 3,000 entries, but it’s the size of the fight in this dog. The venue is a horse farm at the top of a big hill in central Ohio. Getting there is the first obstacle, this was my 3rd year in attendance and still my GPS takes me somewhere different each time and I end up having to do some searching. Luckily, when you get within several miles, the Ninja has put out signs to direct lost travelers. All the obstacles are in view in the festival area and it makes for some truly top-notch spectating. The drawback being that this is the middle of the summer in the Midwest and there is no shade to be found. 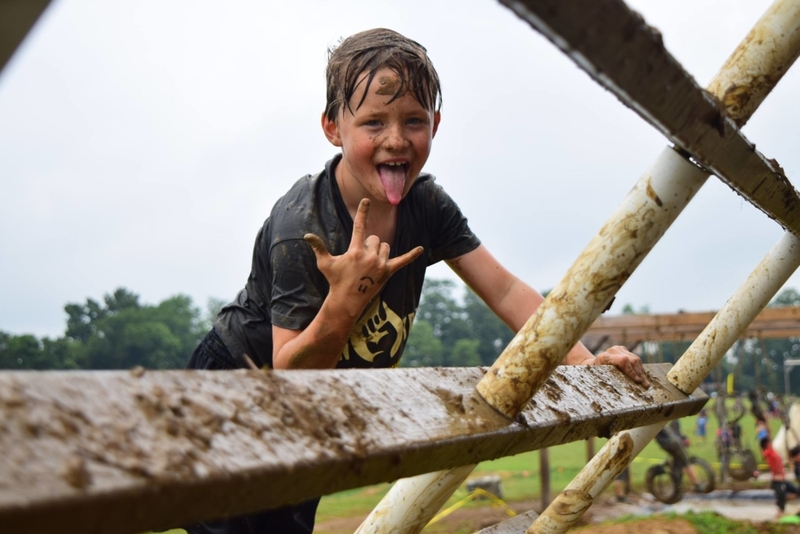 Every year the route is completely different but there are a few things you can be certain of, the runners will start at the top of the hill and finish with a final gauntlet of mud mounds, slacklines, and a final low-crawl. Between those two points, anything seems to be fair game. I keep mentioning being atop of a hill, and I feel like it’s time to give some perspective. This “hill” is reminiscent of a cliff, it’s steep, my watch read several climbs of 45%+ grade and littered with sharp rocks, many of which are lose and free to move around under your feet. Most of the running during the event is done down off the top of the hill with participants returning back up to the top on several occasions for the obstacle portions of the race. All-in-all this year we climbed about 600ft. Mile per mile that’s a lot of climbing and on a short course like this where competitors are maxing out their heart rate the whole time, it’s a slug-fest with the acid burning in your legs. 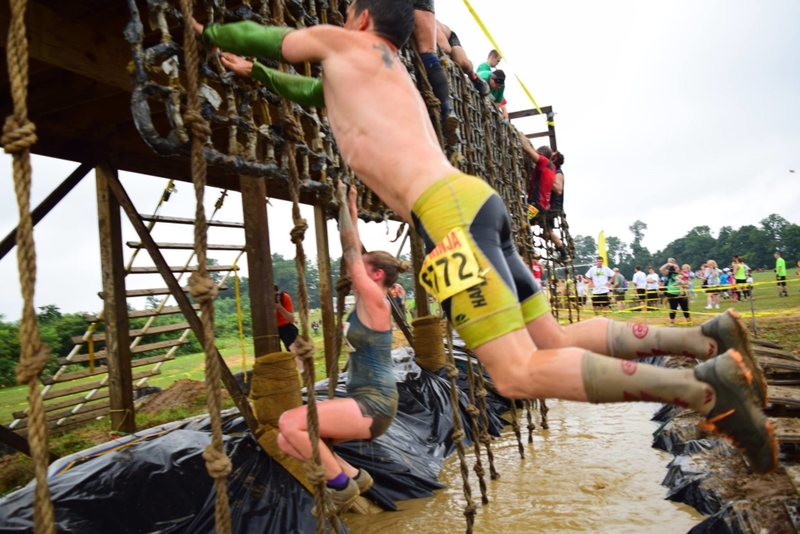 The obstacles are unique, several of which you will not see anything else like at any other events. Some of the standouts are the 13ft wall and giant pipe to get over which require racers to assists each other before continuing on with their battles on the other side. There is also “American Ninja Warrior,” a springboard assisted jump across a pool to grab a rope net and pull yourself up to a towering platform and a giant muddy warped wall. No obstacle comes with the polish of something from a series like Battlefrog or Savage but the ingenuity can trump some of those big corporations. Even their monkey bars are like nothing you’ve ever seen. Mud Ninja has developed a fan base for doing their own thing and doing it well consistently over the years. Every year they change up the course and add a new obstacle or two, every year it seems to get more punishing and by consequence, more rewarding. The course is challenging, the spectating is great, the vendors are great, the organizers are friendly, and the cost is low. You really can’t get upset at that. 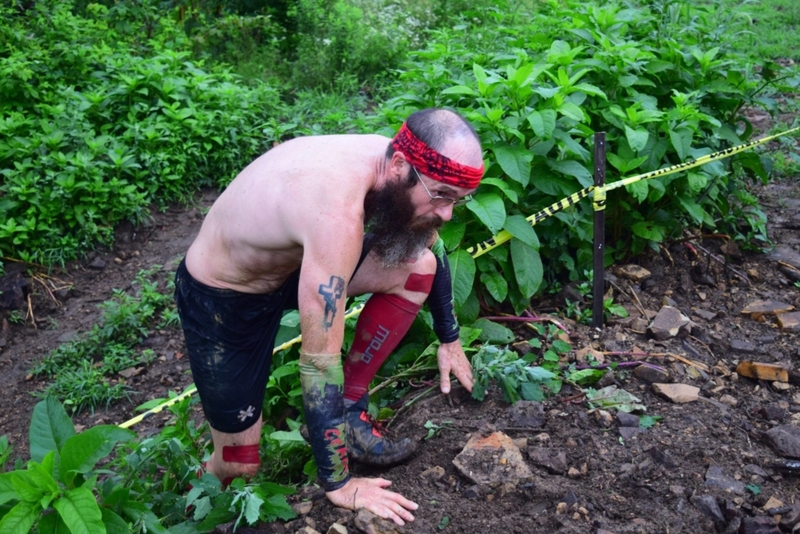 Kevin Parrish is an aspiring elite Obstacle Course Racer. You’ll find him traveling the country racing in the Spartan Race circuit and any other race he can fit in his schedule, as he works to make it to the top 50 in 2014. He writes about and shares his experiences, tips, reviews and insights into the world of OCR.